Review: "Haken: Visions" - Sea of Tranquility - The Web Destination for Progressive Music! As if their debut wasn't strong enough, UK band Haken have certainly kicked things up a notch or two with their sophomore release Visions. Heavier and far more technical & progressive than the debut, Visions is a staggeringly brilliant example of progressive metal the way it oughtta be, jam packed with soaring melodies, catchy hooks, crunchy & inventive riffs, whirlwind instrumental passages, virtuoso solos, and songs that are just flat out instantly memorable for a bazzilion reasons. Tunes like "Nocturnal Conspiracy" and "Portals" deliver dramatic, jaw dropping prog-metal firmly in the school of classic Dream Theater, yet by no means copying the genre legends. For more atmospheric, pop flavored prog, you can't go wrong with the dreamy, almost Porcupine Tree influenced numbers "Shapeshifter" and "Deathless", both featuring stellar lead vocals from Ross Jennings. And Haken of course deliver the monumental epic in the form of the 22-minute closing title track, a prog masterpiece with surging keyboards, blazing guitar work, intricate rhythms, loads of atmosphere as well as churning metal thump. Words almost can't express how much of a joy Visions truly is, a collection of songs that will fully satisfy both the prog & metal love in everyone. The vocals are outstanding, the musicianship supreme, and the songwriting top notch. 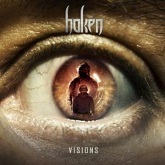 There have been a lot of very good progressive metal releases here in 2011, and now Haken's Visions has joined that list and shot straight up near the top. Though the band mightily impressed with the debut a few years ago, this signals the arrival of a major player on the scene, in a big way. London-based progressive metal outfit Haken immediately gained a reputation as one of the new decade's biggest talents with the release of 2010's Aquarius, and Visions proves that they have no intent of slowing down. The band's unique and modern blend of progressive rock and metal is still fully in-tact, and Visions effectively delivers over seventy minutes of top-notch progressive metal wizardry. Make no mistake - Visions is anything but a sophomore slump, and I'd even venture to say that this is a notch above their masterful debut album. This is a well-composed, focused, and mature masterpiece of modern progressive metal. Absolutely essential. With Aquarius, Haken established a distinct blend of progressive metal that, while still drawing heavily from the likes of Dream Theater and Pain of Salvation, sounded totally original and unique. Visions is more or less that same exact style, but a lot more focused and mature (in my mind, at least). Any flaws that were found on Aquarius - which were, admittedly, not very many - are nowhere to be found on Visions. Gone are the out of place growled vocals, as well as a few of the more unfocused sounding instrumental sections of Aquarius. Visions strikes me as a very polished, mature, and concise work of art - although the songs are exceptionally long and complex, and the full album exceeds the seventy-minute mark, there's hardly a weak moment found on Visions. The first thing that will grab the attention of most prog fans is probably the epic, 22-minute title track. On this song especially, Haken's masterful abilities as composers are shown in full-force; through all of the complexity and odd time signature shifts, there's not an awkward transition anywhere in sight. Any listener should not let this overshadow the rest of their listening experience, though - the other sixty minutes or so are every bit as amazing. The Porcupine Tree-sounding "Deathless" is another big highlight, with its somber lyrics and melancholic keyboard textures sending shivers up my spine every time. "Nocturnal Conspiracy" is probably the other highlight, with Ross Jennings's fantastic vocal performance grabbing my attention immediately. Picking highlights is rather difficult, however, when the entire album is this damn good. One thing that really took me by (pleasant) surprise about Haken's debut was how professional and confident they sounded as musicians - that's still definitely the case with Visions. All five instrumentalists are technically outstanding and musically pleasing to listen to, and every single one of them delivers their fair share of jaw-dropping moments throughout Visions. Ross Jennings's vocals are also powerful and unique - he sounds very different from your average prog metal vocalist, and I think his mid-range style is another factor that helps give Haken their own identity. To top things off, Visions also sports a remarkable production job. The mix is evenly spaced and every instrument is powerful and clear, resulting in a modern sound that is simply unbeatable. If you've got a good pair of headphones on, it sounds almost as if the band is right next to you playing the music - this really sounds that good. While perhaps less adventurous than Aquarius, Visions is an equally terrific (and possibly even more mature and concise) masterpiece from Haken. I'm not one to usually feed the hype machine, but this British prog metal act is one case where you truly must believe the hype - so far these guys have crafted two stunning masterpieces over the course of about a year. I'll be eagerly awaiting the next exports from Haken, and in the meantime I'll keep enjoying the hell out of Visions. Of course, 5 stars are the least I can give here. 2011 has been a year filled with great albums (particularly in the prog metal genre), but Visions is a truly essential masterpiece that should be experienced by any fan of progressive rock and metal. So after two amazing albums in a row, all I have left to say is 'keep up the great work'! Everyone who heard Haken's first album Aquarius knew it was going to be hard for them to match their debut, but the impossible has happened. Visions not only matches its predecessor, but it also eclipses it in scope and emotional breadth. For those unfamiliar with the band, Haken treads the fine line between progressive rock and progressive metal, with chops galore (never overused) and melodic constructs and compositional ideas that stand the test of time. In this sense, they could be compared to bands like later-day Sieges Even, Enchant, and Magellan, though musically all of these bands sound very different. Haken's music never gets overbearingly heavy, but it is not in the realm of Spock's Beard kind of progressive rock either. Actually, the music is very heavy in terms of feel and atmosphere rather than riffing and rhythmic movements. Visions sees the band growing into a darker realm compared to its predecessor (think Dream Theater's shift from Images & Words to Awake). The guitars assume a more prominent role in the songs; almost every song features intricate riffing and heavy arrangements. Both instrumental tracks, the Lloyd-Webber-style overture of "Premonition" and cleverly arranged "Portals" feature Richard Henshall and Charlie Griffiths' guitar riffs cutting through melodic contexts with awesome drum fills, dense key experimentation, chiming bass throbbing violently in a freeform jazz format, and smooth, liquidy guitar phrases. "Portals" is more intense, with dazzling stop-and-go riffing, overlays of jazz chords, atmospheric breakdowns, and a full, warm guitar tone. That said, the use of keyboards that defined the sound character of Aquarius is still very much intact. Diego Tejeda is the central figure of every atmospheric undercurrent. He punctuates both the vocals and guitars on "Nocturnal Conspiracy," possibly the most 'complete' song Haken has written. It has a strange "Bohemian Rhapsody"-like feel, developing patiently with spoken vocals which eventually take on a hypnotic quality with swift yet natural-sounding shifts in melody. Tejeda's brilliant piano work and role during the instrumental jam session elevates the piece to another level; it is his use of myriad sound colours and texture that conceals the internal complexity of the piece. His sonic touch involves thematic cross-chimings; everything is built on his calibrated beats and rests, meter and rhythm. Vocalist Ross Jennings is the kind of vocalist that if he were to leave there'd be no more band. He is crucial to the sound of Haken. His more theatrical singing, with the occasional death growl used for texture and contrast on Aquarius, has been replaced with more emphasis on unforgettable vocal harmonies. I'd liken his growth as a singer to that of Arno Menses' style from the first Sieges Album to their criminally overlooked masterpiece Paramount. On the piano ballad "Deathless," Jennings adopts a similar approach building tension which is impossible to ignore. This makes you focus on the lyrics which are never pretentious or overwritten (the melody and impact of the line "No one's gonna miss me when I'm gone" is addictive). The keyboards recall something Kevin Moore would play on the first Chroma Key disc: sparse, utterly dark, and flowing evocatively. What draws me to Jennings' singing is his ability to create melody and hooks in a tension-filled sound more so than his tone or timbre. Actually the vocal melodies on this album keep revealing themselves with each successive listen. The first time I heard "Nocturnal Conspiracy," I was amazed at its flow, the instrumental passages, and the way the keys highlighted the song's most pivotal moments. Then, I came to discover each nuance in the vocals (thanks to the great mix). The shift from deliberately monotonous singing to the haunting and theatrical style in the second half is this man's creative apex, climaxing with the "No one is coming to my defense" melody. I don't want to ignore a single song on the album because they are all given their own character. Although the songs are definitely cut from the same cloth given that it's the same lineup, they are crafted with a clearer sonic vision. The appropriately titled "Insomnia" features transitions that are both smooth and organic (the band almost left this one off the album because they had many sleepless nights piecing it together). The melding of drum beats with electronic synth patches and a more vocal-based style works the piece to a focused twin guitar harmony that engulfs you up until the beautiful classical coda. "The Mind's Eye" is the band's testimony that they are also able to write more straightforward, dare I say catchy, songs without diluting the progressive aspect of the composition. "Shapeshifter" is probably a personal favourite of mine. It weaves heavy riffing and circus-music like passages through odd patterns before settling down for yet another slower passage that allows the vocals to shine like never before, and again the vocal melody is arresting. The bass is prominent and sturdy; MacLean accentuates and redefines the themes constantly (check out some To-Mera if you want to hear this guy in a heavier context). Just when you're physically exhausted by the beauty of the vocal melody, the same theme is repeated, on guitars this time! The vocals are lowered in the mix, and Jennings delivers a similarly designed stanza an octave lower this time � this is musical perfection. The album concludes with the towering epic "Visions," which is a culmination of the current Haken sound: titanic riffs, awesome vocal melodies, RIO-like transitions that are hard to follow, jazzy excursions, 'maniacal' vocal parts, and drawn-out guitar elements. That said, at this point, I need more time to fully absorb this one and I feel it is a bit overblown. My opinion may change upon repeat listens, but so far I consider the band's 'shorter' pieces a tad better and more focused. Finally, the production is stunning. This album is right up there with this year's Wolverine, Devin Townsend, Ulver, and Opeth albums in terms of sonic quality. I am truly amazed at Christian Moos' stereo mixing; everything is expertly produced. Spacelab Studios always puts out fantastic-sounding material, and Moos has become one of my favourites. His achievement on the final track involves close to 200 audio tracks. The band should always work with him. Also, the dynamic range is out of this world. If you're sick of compressed and loud albums, you'll be blown away by Visions. This is probably the final progressive masterpiece of 2011. You don't want to miss out on it.